Samsung is all set to launch a new set of mid-tier smartphones on the 10th of April, where the company is expected to launch the Samsung Galaxy A20, Samsung Galaxy A40, and the Samsung Galaxy A90 smartphones. Now, the Samsung Galaxy A40 has surfaced online, revealing the design, features, and specifications of the smartphone. Here is everything you need to know about the Samsung Galaxy A40. 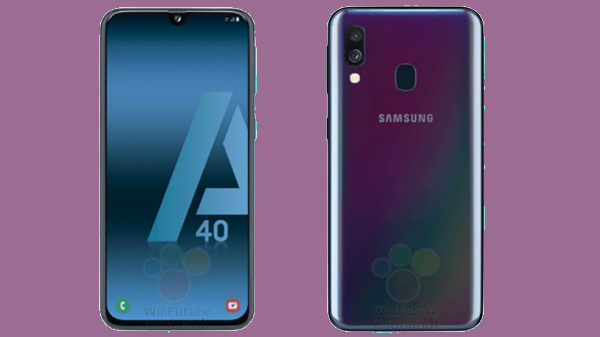 At first glance, the Samsung Galaxy A40 looks similar to the Samsung Galaxy A50 with a colorful back panel. The one visible difference between the Galaxy A50 and the Galaxy A40 is the placement of the fingerprint sensor. The Samsung Galaxy A50 has an in-display fingerprint sensor, whereas the Samsung Galaxy A40 has a rear-facing fingerprint sensor. The smartphone has an almost bezel-less design with an Infinity-U notch on the top, offering higher screen to body ratio, compared to other mid-tier devices from Samsung. On the bottom, the smartphone has a USB type C port with a dedicated 3.5mm headphone jack and the main speaker. The smartphone will be available in quite a few colors, including black, blue, coral, and white. The Samsung Galaxy A40 has a 5.7-inch Super AMOLED display with FHD+ resolution, protected by 2.5D curved tempered glass. The Exynos 7885 Octa-core chipset powers the smartphone with 64 GB of internal storage with 4 GB RAM on the base variant. There are two cameras on the back, but the exact implementation is yet to be known, considering the recent trend, the device is most likely to come with a standard RGB sensor and a super wide angle lens, similar to the Samsung Galaxy M20. The smartphone will run on Android 9 Pie OS with Samsung's own One UI. Stay tuned to know more about the Samsung Galaxy A40.